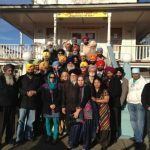 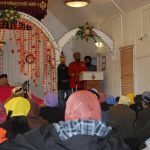 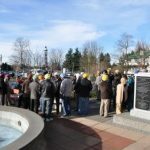 On Sunday, January 20th, many community members, both young and old alike, as well as local politicians and dignitaries came to take part in the official opening of the third exhibition at the Sikh Heritage Museum. 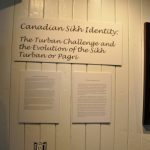 Located on the ground floor of the National Historic Site Gur Sikh Temple, the Sikh Heritage Museum’s third official exhibition is called Canadian-Sikh Identity: The Turban Challenge and the Evolution of the Sikh Turban of Pagri. 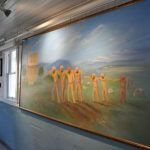 The exhibition contains three parts. 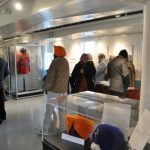 The first part of this exhibition –on the evolution of the Pagh’s- detail the evolution and history of the paghs from the time of the Sikh Gurus, to the various styles we see today. 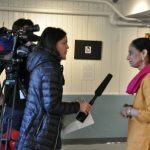 The second part of the exhibition contains copies of Vancouver-based newspaper articles from the year 1906, highlighting some of the discriminatory views and viewpoints many turbaned Sikhs were faced with when they first arrived to BC. 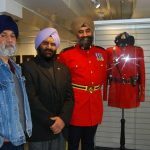 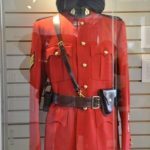 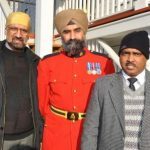 On display there is the Army Dress outfit with pagh, and the RCMP Serge with pagh – which serve as examples of great accomplishments by Sikhs in Canada. 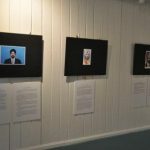 The third part of the exhibition can be seen in the media room. 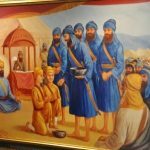 Each new exhibition highlights a pioneering Sikh family. 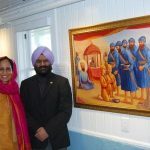 This third exhibition highlights Baba Dharm Singh Gill and his family through some beautiful archival images. 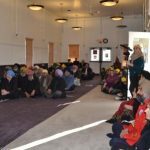 After visitors took part in the viewing the exhibition, everyone was invited into the darbar hall to take part in some speeches. 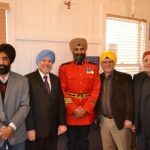 Those speaking included: MLA John Van Dongen, and Abbotsford Mayor Bruce Banman. 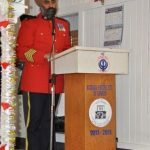 The highlight of the opening was a keynote address provided by Staff Sergeant Baltej Singh Dhillon. 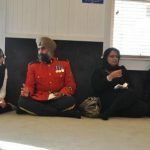 Mr. Dhillon provided an inspiring and thoughtful address, highlighting his struggles to maintain his kesh and his pagri while serving in the RCMP, but also highlighting the amazing changes in Canadian society in terms of acceptance, and not just mere tolerance. 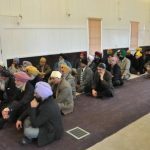 Following ardas, the entire sangat was invited to take part in guru ka langar across the street at the Khalsa Diwan Society Gurdwara. 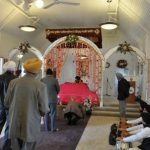 The Sikh Heritage Museum is open seven days a week from 10am-5pm. 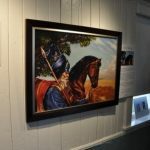 We invite any and all to visit this beautiful exhibition which also serves as a great learning experience.